Hotels and tourism businesses worldwide have been keen to capitalize on travelers' growing “eco-consciousness.” Besides the potential boost in revenue from “green” marketing, ecologically sensitive and energy efficient design, building and operations can yield substantial savings; it can also reduce the vulnerability and risk exposure of hotel and tourism businesses to fluctuations in the prices of energy, water and environmental degradation. Aiming to earn Platinum-level LEED certification from the U.S. Green Building Council, the family-run Shore Hotel in Santa Monica, Calif. is installing cutting-edge energy storage and power management technology developed by Green Charge Networks. The demand charges California's electric utilities charge commercial and industrial customers for electricity usage during peak periods are among the highest in the nation, and on average make up 50 percent or more of businesses' electric bills. Combining historical energy usage patterns with real-time weather data, installing Green Charge's GreenStation platform could cut the Shore Hotel's demand charges by as much as 50 percent. In contrast to standard rates for electricity usage, which are measured in kilowatt-hours (kWh), demand charges are assessed according to power usage during peak-demand periods and measured in kilowatts (kW). While the former has been trending lower for California businesses over the past decade, the latter has been trending higher--rising over 7 percent annually, Green Charge explains in a press release. In addition to installing GreenStation, the Shore Hotel is installing an electric vehicle (EV) charging station, a decision management is taking based on the growing number of EVs guests are driving. Shore's GreenStation will help there as well, reducing demand charges from spikes in electricity usage resulting from EV charging. The combination of ongoing cost reductions and performance enhancements in commercial and industrial-scale battery storage, smart grid and solar photovoltaic (PV) systems, along with the high and more volatile costs of fossil fuel energy, is leading a growing number of businesses to make investments in energy efficiency and intelligent energy storage-power management systems. Adding significantly to the impetus is a recently enacted California state mandate requiring that investor-owned utilities acquire 1,325 megawatts (MW) of electricity and thermal storage capacity by 2020. In addition, California's Self-Generation Incentive Program (SGIP) “pays $2 per watt for an energy storage solution. 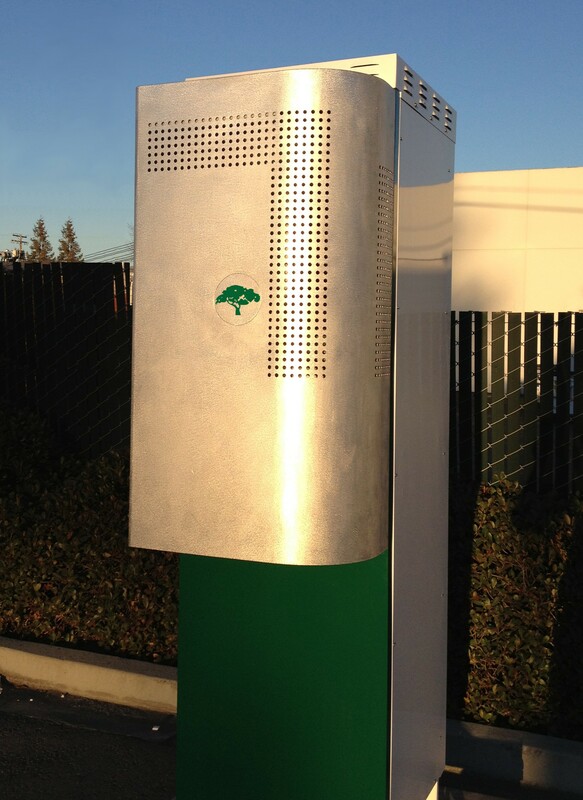 That's typically half the cost [of installing a GreenStation platform], which has really helped the state of affairs in California,” Shao told 3p in a recent interview. Besides Shore Hotel, Green Charge counts 7-Eleven, Avis and Walgreens as customers. All told, the company has closed more than 2 MWs' worth of Power Efficiency Agreements.